Teide National Park (Spanish: Parque nacional del Teide, pronounced [ˈpaɾke naθjoˈnal de ˈtei̯.ðe]) is a national park located in Tenerife (Canary Islands, Spain). The national park is centered on Mount Teide, the highest mountain of Spain (3,718 meters high) in addition, the highest volcano in the Atlantic Ocean islands and the third highest volcano in the world from its base in the ocean floor (7.500 meters high). Its national park status was passed on 22 January 1954, making it the third oldest national park in Spain. Pico Viejo, also included within the national park limits, is the second highest volcano in the Canary Islands with its 3,135 m peak. Mount Teide and Pico Viejo are the only two peaks in the Canary islands rising above the 3,000 m level. The park has an area of 18,990 hectares located in the municipality of La Orotava. It was named a World Heritage Site by UNESCO on June 28, 2007. Since the end of 2007, it has also been one of the 12 Treasures of Spain. On a ridge, to the east of Teide, are the telescopes of the Observatorio del Teide. Teide is the most visited national park in Spain and Europe and −by 2015− the eighth most visited in the world, with some 3 million visitors yearly. In 2016, it was visited by 4,079,823 visitors and tourists reaching a historical record. The Teide is the most famous natural icon not only of Tenerife but also of all the Canary Islands. There are morning and afternoon coach trips through the park, departing from selected areas in the south of Tenerife's tourist towns. Access to the peak requires a free permit that needs to be booked in advance. The Teide National Park has a large historical value. This place had an important spiritual significance to aboriginal Guanches and important archaeological sites have been discovered in the park. For the Guanches the Teide was a place of worship, they thought it was the gate of hell (Echeyde). National park status was declared on January 22, 1954, which was one of the third in Spain. In 1981 the park was reclassified and established as a special legal regime. In 1989, the Council of Europe awarded the European Diploma of Protected Areas, in its highest category. This recognition and conservation management has been subsequently renewed in 1994, 1999 and 2004. In celebration of the 50th anniversary of its transformation into a national park, in 2002 the paperwork was begun to declare the park a UNESCO World Heritage Site. On June 28, 2007, after five years of work and effort, UNESCO decided to declare the Teide National Park, World Heritage Site in the World Heritage Convention of UNESCO held in Christchurch, New Zealand. Teide National Park is also at the end of 2007, one of the 12 Treasures of Spain. Teide National Park is complementary to the Hawaiʻi Volcanoes National Park, this is mainly due to being in each of them represented the volcanic structures and forms less evolved magmas of such islands (Hawaii) and more evolved and differentiated (Teide). Moreover, Teide National Park shares similar scenic characteristics with the Grand Canyon National Park in Arizona, United States. The lava flows on the flanks of Teide weather to a very thin, but nutrient and mineral rich soil that supports a diverse number of plant species. Vascular flora consists of 168 plant species, 33 of which are endemic to Tenerife. Forests of Canary Island pine (Pinus canariensis) occur from 1000–2100 m, covering the middle slopes of the volcano, and having an alpine timberline 1000 m lower than that of continental mountains of similar latitude. At higher altitudes, the Las Cañadas caldera provides sufficient shelter for more fragile species such as the Canary Island cedar (Juniperus cedrus), and the Canary Island pine (Pinus canariensis) to grow. The most dominant plant species in the Teide National Park are the Teide white broom (Spartocytisus supranubius), which has a white and pink flower; the Canary Island wallflower (Erysimum scoparium), which has white and violet flowers; and the Teide bugloss (Echium wildpretii), whose red flowers form a pyramid up to 3m in height. The Teide daisy (Argyranthemum teneriffae) can be found at altitudes close to 3,600m above sea level. The Teide violet (Viola cheiranthifolia) can be found right up to the summit of the volcano, making it the highest flowering plant in Spain. These plants are adapted to the tough environmental conditions on the volcano such as high altitude, intense sunlight, extreme temperature variations, and lack of moisture. Adaptations include acquiring semi-spherical forms, acquiring a downy or waxy cover, reducing the exposed leaf area, and having a high flower production. Flowering takes place in the late spring or early summer, in the months of May and June. The Teide National Park contains a huge range of invertebrate fauna, over 40% of which are endemic species, with 70 species only being found in the national park. The invertebrate fauna include spiders, beetles, dipterans, hemipterans, and hymenopterae. In contrast, Teide national park has only a limited variety of vertebrate fauna. Ten species of bird nest in the park. These include the blue chaffinch (Fringilla teydea teydea); Berthelot's pipit (Anthus berthelotii berthelotii); the Atlantic canary (Serinus canaria); and a subspecies of kestrel (Falco tinnunculus canariensis). 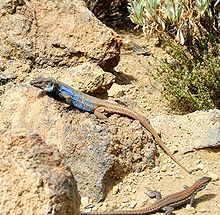 Three endemic reptile species are also found in the park – the Canary Island lizard (Gallotia galloti galloti), the Canary Island wall gecko (Tarentola delalandii), and the Canary Island skink (Chalcides viridanus viridanus). The only mammals native to the park are bats, the most common species of which is Leisler's bat (Nyctalus leisleri). Other mammals such as the mouflon, the rabbit, the house mouse, the black rat, the feral cat, and the Algerian hedgehog have all been introduced to the park. The similarity between environmental conditions and geological Teide National Park and the planet Mars have turned this spot volcanic reference point for studies related to the red planet. The analogies between the red planet and parts of Tenerife make the island the ideal place for testing instruments that will travel to Mars and reveal past or present life on Mars. In 2010 a research team tested at Las Cañadas del Teide, the Raman instrument to be sent in the next expedition to Mars, ESA-NASA ExoMars from 2016-2018. In 2011 a team of United Kingdom researchers visited the national park in June to test a method for finding life on Mars and finding places to try in 2012, new robotic vehicles. Rapa Nui National Park (Easter Island, Chile). Besides the Teide National Park participates in different international programs and exchange advice with other national parks in the world, especially Central America, South America and Europe. In regard to international cooperation, the Teide National Park has provided technical support to the Souss-Massa National Park located in southwestern of Morocco. Brian May wrote the Queen song "Tie Your Mother Down" at the Observatorio del Teide at Izaña (altitude of 7,770 feet), in the autumn of 1971, while working on his grad thesis. This dramatic scenery has been featured in films such as One Million Years B.C. (1966), Intacto (2002), Clash of the Titans (2010) and Wrath of the Titans (2012). The Raquel Welch poster of One Million Years B.C. that plays a significant role in the 1994 film The Shawshank Redemption was taken at the Teide. Mike Oldfield included in his compilation The Complete fel of 1985, the song Mount Teide dedicated to this famous volcano from Tenerife. On December 8, 2008 following an initiative from the Jewish community of the Canary Islands, an Israeli flag was placed near the summit of Mount Teide. The park has a small chapel dedicated to the Virgen de las Nieves which is the highest Christian church in Spain. Tenerife was the place where L. Ron Hubbard (founder of the Church of Scientology) called picked "OT-III materials", according to this doctrine one of the volcanoes which were cast the "thetans" 75 million years ago is the Teide together with other volcanoes in the world, mainly from Hawaii. On 24 June 1989 the radio Espacio en Blanco of the Radiocadena Española called a "UFO Alert" in the Teide National Park in order to achieve some kind of contact with extraterrestrials. This event was attended by about forty thousand people. On January 8, 1998, members of a cult led by German psychologist Heide Fittkau Garthe were arrested, when they tried to perform a ritual suicide on Teide. The sixth installment of The Fast and the Furious starring Vin Diesel, and directed by Justin Lin, The Teide had the main stage for most of its outer planes. The Teide National Park has become a popular training ground for top professional cyclists, as it allows them to train at altitude whilst also having access to sea-level terrain for high-intensity training, in stable weather conditions, with few distractions due to its isolated location. Teams who have used the park for training include Team Sky, Liquigas and Team Astana. In 2017, Teide National Park was the eighth most sought after site on the Google Street View platform with a total of 8.6 million visitors, being similar to places like the Taj Mahal, Mont Blanc, the Necropolis of Giza, Angkor Wat or Stonehenge. In 2018, the surroundings of the National Park hosted part of the filming of the American film Rambo V: Last Blood, starring Sylvester Stallone and Paz Vega among others. ^ "Teide National Park". World Heritage List. UNESCO. Retrieved 2009-01-18. ^ "Parque Nacional del Teide. Ascenso, Fauna, Flora..." Retrieved March 21, 2016. ^ "Mount Teide Cable Car Prices and Timetable | Volcano Teide". www.volcanoteide.com. Retrieved 2018-06-20. ^ "El Parque Nacional del Teide, Patrimonio Mundial: Valores geológicos determinantes" (PDF). Acceda.ulpgc.es. Retrieved 20 September 2014. ^ a b Dupont, Yoko L., Dennis M., Olesen, Jens M., Structure of a plant-flower-visitor network in the high altitude sub-alpine desert of Tenerife, Canary Islands, Ecography. 26(3), 2003, pp. 301–310. ^ "Tenerife National Park - Flora". Tenerife Tourism Corporation. Retrieved 2007-12-12. ^ C. Leuschner, Timberline and alpine vegetation on the tropical and warm-temperate oceanic islands of the world: elevation, structure and floristics, Vegetatio 123, 1996, pp. 193–206. ^ "Tenerife National Park - Fauna". Tenerife Tourism Corporation. Retrieved 2007-12-12. ^ P.R. Grant, "Ecological compatibility of bird species on islands", Amer. Nat., 100(914), 1966, pp. 451–462. ^ Lever, Christopher (2003). Naturalized Reptiles and Amphibians of the World (First ed.). Oxford University Press. ISBN 978-0-19-850771-0. .
^ a b "Tenerife se convierte en un laboratorio marciano". Elmundo.es. 3 November 2010. Retrieved 20 September 2014. ^ "Buscando "marcianos" en el Teide". Loquepasaentenerife.com. Retrieved 20 September 2014. ^ "España: Cooperación en Parques Nacionales" (PDF). Otros.conaf.cl. Retrieved 20 September 2014. ^ a b "Cooperación internacional entre parques nacionales" (PDF). Magrama.gob.es. Retrieved 20 September 2014. ^ "Brian May". Answers.com. Retrieved 20 September 2014. ^ Montgomery, Jack (22 February 2011). "Clash of the Titans 2 & Los Cristianos Carnival in Tenerife News of the Week". Tenerife Magazine. Archived from the original on 3 September 2014. Retrieved 3 September 2014. ^ "La bandera de Israel ondea en el Teide (Islas Canarias)". Israelgrafico.tyepad.com. Retrieved 20 September 2014. ^ "Cienciólogos en Tenerife". Loquepasaentenerife.com. Retrieved 20 September 2014. ^ "España: Los Lugares Del Contacto". Munoparanormal.com. Retrieved 20 September 2014. ^ "La policía frustra el suicidio colectivo de los 33 miembros de una secta en Tenerife". Hereoteca.lavaguardia.es. Retrieved 20 September 2014. ^ Fotheringham, William (23 May 2012). "Volcano gives Bradley Wiggins the fire for assault on Tour de France". guardian.co.uk. Retrieved 16 July 2013. Wikimedia Commons has media related to Teide National Park. Wikivoyage has a travel guide for Teide National Park. Province of Tenerife, also Province of Santa Cruz de Tenerife, is a province of Spain, consisting of the western part of the autonomous community of the Canary Islands. It consists of about half of the Atlantic archipelago: the islands of Tenerife, La Gomera, El Hierro, and La Palma. It occupies an area of 3,381 km². It also includes a series of adjacent roques. Gran Canaria, is the second most populous of the Canary Islands, an archipelago off the Atlantic coast of Northwest Africa which is part of Spain. As of 2018 the island had a population of 846,717 that constitutes approximately 40% of the population of the archipelago. Tenerife is the largest and most populated island of the seven Canary Islands. It is also the most populated island of Spain, with a land area of 2,034.38 square kilometres (785 sq mi) and 904,713 inhabitants, 43 percent of the total population of the Canary Islands. Tenerife is the largest and most populous island of Macaronesia. There are fifteen national parks in Spain: ten in the Iberian Peninsula, four in the Canary Islands and one in the Balearic Islands. Twelve of the seventeen autonomous communities of Spain have national parks. Canary Islands has the most (four), followed by Andalusia, Castile-La Mancha and Castile and León. There are five autonomous communities that have no national parks: Basque Country, La Rioja, Murcia, Navarre, Valencian Community. Mount Teide is a volcano on Tenerife in the Canary Islands, Spain. Its 3,718-metre (12,198 ft) summit is the highest point in Spain and the highest point above sea level in the islands of the Atlantic. Vilaflor is a municipality and a village in the south-central part of the island of Tenerife, one of the Canary Islands, and part of the Santa Cruz de Tenerife (province), Spain. Vilaflor, with an altitude of 1,400 m, is the highest village of Tenerife, situated south the Teide volcano. It is located 7 km north of San Miguel de Abona and 51 km southwest of the island's capital Santa Cruz de Tenerife. The population is 1,804 (2013) and the area is 56.26 km². La Orotava is a town and a municipality in the northern part of Tenerife, one of the Canary Islands of Spain. The area of the municipality stretches from the north coast to the mountainous interior, and includes the summit of the Teide volcano, Canary Islands' and Spain's highest point at 3,718 m. At 207.31 km2, it is the largest municipality of the island of Tenerife. The population is 41,255 (2013). Garajonay National Park is located in the center and north of the island of La Gomera, one of the Canary Islands (Spain). It was declared a national park in 1981 and a World Heritage Site by UNESCO in 1986. It occupies 40 km2 and it extends into each of the six municipalities on the island. Echium wildpretii is a species of flowering plant in the family Boraginaceae. It is an herbaceous biennial plant that grows up to 3 m (10 ft) in height. The species is endemic to the island of Tenerife, and is found mainly in Las Cañadas del Teide. The subspecies E. wildpretii subsp. trichosiphon occurs at high altitudes on La Palma. The common names are tower of jewels, red bugloss, Tenerife bugloss or Mount Teide bugloss. The Spanish name for this plant is tajinaste rojo. Abona is a Spanish Denominación de Origen (DO) for wines located on the southern coastline of Tenerife,, and acquired its DO in 1996. Viola cheiranthifolia is a species of the genus Viola. It is also known as the Teide violet and Teide daisy. Valle de Güímar is a Spanish Denominación de Origen (DO) for wines located on the south-eastern coastline of Tenerife, and acquired its DO in 1996. Pico Viejo is a volcano located on the island of Tenerife. It is the second highest peak of Tenerife and the Canary Islands with a height of 3,135 m above sea level, a huge crater approximately of 720 metres in diameter. The Roque Cinchado is a rock formation, regarded as emblematic of the island of Tenerife. It lies within the Teide National Park in the municipality of La Orotava, near the volcano of the same name, in the heart of the island. Adenocarpus viscosus is a shrubby species of flowering plant in the legume family Fabaceae, subfamily Faboideae. It is endemic to the Canary Islands where it is known locally as Codeso del Pico. It can be found above 1,800 metres (5,900 ft) on two of the islands, La Palma in Caldera de Tabouriente and Tenerife where it is a dominant shrub in Teide National Park and occurs in parts of Corona Forestal Nature Park and Reserva Especial de las Palomas. Pilancones Natural Park is located in San Bartolomé de Tirajana municipality on the island of Gran Canaria, Spain. Its area is 5794.4 ha. It adjoins Roque Nublo country park to the north, and Fataga protected area to the east. The park plays an important role in soil protection and the replenishment of an aquifer, along which there are several ravines running southward which are of geomorphological interest and landscape value. The pine forests on hilltops are a well-preserved habitat with abundant bird life. The park also harbours several varieties of cactus and spurge, and a number of aquatic habitats. The park takes its name from natural pools, formerly known locally as pilancones, which remain after the runoff of water. Throughout the area there are threatened animal and plant species, and features of scientific interest.